Fine, sunny weather tempted over 20 volunteers to take part in this autumn’s town centre community litter pick on Saturday 20 October. The biannual event was attended by families, members of community groups, Bloomin’ litter volunteers, councillors and staff from Waitrose. 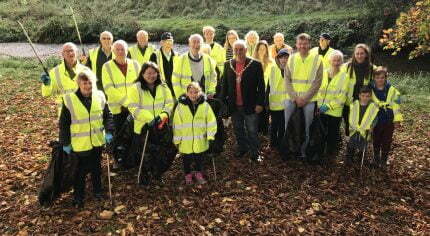 In total the litter-picking volunteers filled 25 sacks of rubbish collected in Farnham town centre. Councillor Stephen Hill, Lead Member for Community Enhancement says: “There is always an element of anticipation amongst litter pickers as to who is going to find the most unusual item of rubbish. This autumn, the ‘prize’ has to go to the person who found a 14” flat screen television! The volunteer litter pickers collected rubbish from Hickley’s Corner to the petrol filling station, Red Lion Lane, Gostrey Meadow, the main town centre roads, the skate park and around the leisure centre. As a small token of thanks, everybody was treated to tea and cake at the end of the litter pick. Community litter picks were also independently organised by Badshot Lea Residents’ Association, Farnham Ramblers and the Bourne Conservation Group.